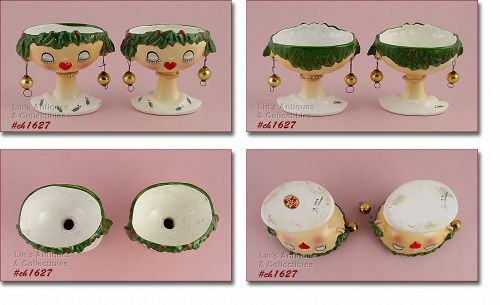 This listing has two gorgeous and somewhat rare Christmas lady head vases! They were made by Holt Howard and are dated 1959. Vases measure 3” tall and both ladies have the original Christmas "ornament" glass earrings that are so often missing or broken. If you look closely, you can see that one of the earring "chains" has been replaced with a wire. Both ladies also wear the original "faux" pearl necklaces. Both vases are in super condition with no chips or cracks. A rare find indeed!